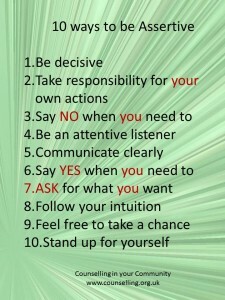 Assertiveness is about effective communication. It is not only about using the right words but ensuring your body language gives the right message. The focal part of assertiveness is positive thinking. Assertive people, who believe in themselves, use positive language, look for positive outcomes and are positive in their respect for other people’s view. This first part of the blog will look at exercises that can be taken to develop your self-awareness, improve the image you portray and the language you use. On a piece of paper, list all the negative things you do not like about yourself. This may include how other people perceive you. Underline any qualities you cannot change. For example, ‘you are going grey’. You cannot change this. You therefore have to accept this and learn to live with it and like it. Additionally you may have problems in life, such as bereavement or illness that you have no control over. Put a tick against negative qualities that you feel you can accept about yourself. Circle all the faults, negative behaviour and failings that you would like to change. For example, ‘you are unable to take criticism’ and ‘you instantly think it is your fault if something goes wrong’. Have you ever been at work or out in the evening with a stain on your shirt and just realised too late? The image you present to others is important as people do use this to whether they perceive you as confident or not. Additionally your body language is important. Both the body language and verbal communication need to match each other. Crossed arms and fixed gaze can be seen as aggressive whereas relaxed posture, open stance and arms held down by your side, reflects a person who is at ease with themselves. To see how your body language can look, position yourself in front of a mirror. Imagine three different situations. And finally, one where someone who has made you angry but has apologised. See how you’re facial expressions and gesture changes and the way you hold your body. Do you look aggressive or confident? Clear concise, assertive vocabulary is an all-important aspect of assertiveness. If you can say statements in a positive way rather than a negative way, it will make people around feel that they can co-operate with you and have a reasonable conversation with you. A down fall of many people who are not assertive is to talk to themselves with a negative phrase. For example, ‘I know they will only get upset’, ‘what if they laugh at me’. Self-pity statements do not help you. You are responsible for your actions and thoughts. It sounds as though you are hopeless and may become a self-fulfilling prophecy. Do not use the words ‘Should’ or ‘can’t’. It is no point reflecting back on what you should have done. You have done it. Learn from it. Assertiveness is about being firm. You either can and you will. Don’t self-doubt. Miserable thoughts just drain you emotionally and make your self-esteem low. So how do you change? You need to identify your negative comments. If you remember them, write them down. You then need to self-talk or write down an alternative positive statement. For example, if you are worried about a meeting at work. Do not believe the inner voice that is telling you ‘you will fail at the meeting’. Instead replace it with ‘whatever happens, I will cope’. Do this exercise with several comments that you remember saying. ‘I am worthy to be listened to’. ‘I am not a failure if I do not succeed. I am a success because I tried’.